Here you have it, my new favorite chocolate cake! I’ve made three chocolate cakes this week (and believe it or not I’m still not sick of chocolate cake) but I’ve been on a mission to create my idea of the best chocolate cake. 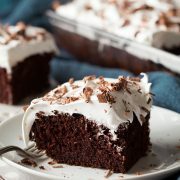 I already have my favorite chocolate frosting that will likely never be replaced so that part was easy, but my old favorite chocolate cake is now just that, an old favorite. I wanted a cake with a little more chocolate (or cocoa anyway), so I decided it was time to create my own chocolate cake recipe. Chocolate flavor. This cake, loaded with it. The boiling water intensifies the chocolate flavor of the cocoa. I’m starting to think it’s a must for all chocolate cakes. Moisture. We all hate dry cakes. I like mine really moist. This one, check. Crumb texture. Is it soft? Is it fluffy or dense? Does it have stability? Soft is definitely a must and I like my chocolate cake somewhere between fluffy and dense. I’m not a big fan of the chocolate cakes that are so fluffy they just crumble apart and don’t have much structure but I also don’t want it so dense that it’s like eating a cheesecake. Perfect frosting. An incredible frosting is just as important as a good cake. It is going to crown the cake after all. This frosting is likely the best chocolate frosting you’ll ever make. Just sayin :). I really hope you love this chocolate cake as much as I do. Find a reason to celebrate and enjoy! A perfectly decadent, rich chocolate cake. 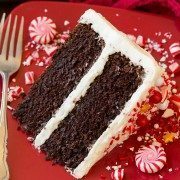 It has the perfect texture, a moist crumb, an abundance of chocolate flavor and its finished with an tempting, creamy chocolate buttercream. In a large, heat proof mixing bowl, whisk together granulated sugar and brown sugar (lumps are fine), then whisk in cocoa powder, baking soda and salt. 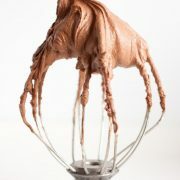 Carefully pour boiling water in to cocoa mixture and immediately whisk to blend well, about 15 - 20 seconds. Allow to cool 5 minutes. Divide mixture evenly among 2 prepared pans. Bake in preheated oven until toothpick inserted into center of cake comes out clean or with a few moist crumbs, about 29 - 34 minutes. Allow to cool in pan 5 minutes, run butter knife around edge of cake and invert onto a wire rack and allow to cool completely (after about 20 minutes of cooling, I placed the cakes into an airtight container to seal in moisture while they finished cooling). Trim tops from cake to form an even layer (they are quite domed so you don't need to make it completely level across - just add a little more frosting to the edges that aren't as level so you don't have to cut off so much cake). Add frosting to top of one round then top with second cake and frost top and sides of cake. Store in an airtight container. In a the bowl of an electric stand mixer, fitted with whisk attachment (paddle attachment works too. Whichever you use just pay attention the the shade of the butter), whip butter on moderately high speed until very pale and fluffy (nearly white in color), about 6 - 8 minutes, occasionally scraping down sides of the bowl. Sift in cocoa powder then add in powdered sugar, 3 Tbsp heavy cream and vanilla and mix on low speed until combine, scrapping down the sides of the bowl as needed and adding up to 1 tbsp additional cream to thin if desired. Increase mixer to medium-high speed and whip mixture until pale and very fluffy about 4 - 5 minutes, occasionally scraping down sides of the bowl.